Through the miracle of modern medicine the life-sustaining machine can pump air into a lung, cause a heart to beat, or a kidney to function, but although it can sustain life, it cannot restore it. Restoration of life calls for a true miracle. Such a true miracle is recounted in the familiar story of how Jesus Christ recalled a man named Lazaros from a premature death by his divine grace. A spark of that divinity was transmitted to Lazaros in the process of his deliverance and instilled in him the grace with which he was to become a saint. Such great emphasis is placed on the return of Lazaros from the dead that his prior life is practically ignored. His true life began after he had died. exactly four days after, since that was the period of time in which he had lain dead before Christ appeared at his tomb in Bethany. 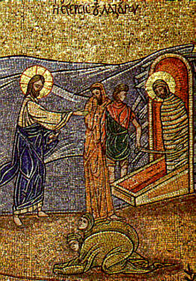 A true friend of the departed Lazaros, as well as of his grieving sisters Mary and Martha, Jesus stood before the tomb and commanded Lazaros to come forth, whereupon Lazaros stepped from oblivion into immortality. Thereafter he became a servant of the Lord in the early development of the new faith. Following the death and resurrection of the Saviour, Lazaros undertook an apostolic mission which carried him to many corners of the empire and ultimately to the island of Cyprus, where he settled after his ordination as bishop of Kition. The apostles of Christ encouraged him to stay on this island, and there he spent the final thirty years of his life, implanting Christianity with the firmness that was to sustain Cyprus centuries later through conquest, piracy, and subjugation. The association of Lazaros with Cyprus has been obscured by events on that strife-torn land, but evidence of his presence there is still extant after nearly two thousand years. Christianity had taken a firm hold on the island when Lazaros died at the age of fifty-eight, this time not to be recalled by, but to join the Messiah who had summoned him many years before. He was buried in Cyprus and according to tradition there was inscribed after his name on his casket the words, "Tetraimeros, friend of Jesus Christ." The word "tetraimeros" is translated the "fourth day," the day on which he was brought back from the grave. Moreover, he was honoured in life as a friend of Jesus and was thus assured a place of honour in the kingdom of heaven. Lazaros was entombed in a small chapel dedicated to his memory. More than 800 years later, Emperor Leo of Constantinople, himself a devout Christian, replaced the chapel which was threatened with ruin with a beautiful cathedral and monastery, a fitting tribute to the personal friend of Jesus. After a time, Leo decided that the proper resting place for St. Lazaros would be in the capital city of Constantinople. That project was probably frowned upon by the islanders who pridefully cherished the shrine of Lazaros, but in due course, they came to accept the plan to place Lazaros in a more hallowed setting. The remains of St. Lazaros were ceremoniously brought to the cultural centre of Constantinople on 17 October 891. A magnificent cathedral was erected in honour of St. Lazaros and his holy relics lie enshrined their in a bronze casket. The official dedication of the cathedral took place on 4 May 892. About the same time the remains of St. Mary Magdalene were also brought to Constantinople by the devout Emperor Leo. Thus the Emperor sought to honour these two friends of Jesus. If a man can be measured by the kind of friends he has, then the measure of St. Lazaros cannot be drawn, because he had the friendship of Jesus Christ. The closeness with the Saviour, although it added considerable lustre to the life of St. Lazaros, extended by a miracle of the Lord, was the deep commitment to Jesus Christ and subsequent mission in his behalf which has made Lazaros a saint of the Greek Orthodox Church. When the life expectancy standards at the time of Christ are considered, it can be said that Lazaros at age fifty-eight departed this earth after having lived a full life.